This post is by Hannah Loosley completed the MA in the Social Anthropology of the Global Economy at the University of Sussex in 2017. Women working in care, catering, cleaning, cashier and clerical jobs (the 5 Cs) have long been neglected in trade unions and politics. Their jobs are seen as ‘extras’ – helping other people be fed and cared for, so they can do their ‘proper’ work. Traditionally, trade unions have been white, male, blue-collar worker-dominated spaces, but things are changing. More and more unions are setting up networks for women and other underrepresented identities, such as LGBTQ and BME people. But though these groups exist, do their members have a voice at the table? Do they have the power to change the agenda? And do they deal with intersections effectively? The integration of women into historically male dominated trade unions is not a new issue, and unions have now also been trying to ‘revitalise’ in order to cater to a more insecure workforce. However, the stories of the Radical Women’s network, below, illustrate that gender and insecure work should be looked at together, because they are experienced together by five Cs women. ‘General’ unions like GMB can appeal to workers in any industry, and are therefore able to expand their membership more easily than unions for specific industries, such as the male-dominated train drivers’ union, ASLEF. Considering that large numbers of workers in the UK are now in precarious employment, and a high proportion of these are women, unions like the GMB need to directly deal with the gendered class issues faced by five Cs women in order to effectively represent current members, and gain new recruits. 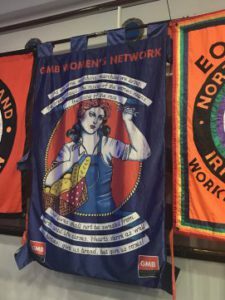 The Radical Women’s Network of the GMB North West and Irish Region is a space in which low-paid women engage in union activity. Here, the intersection between class and gender inequality is recognised, and gendered class issues regularly surface. In my Master’s dissertation research, I analysed the ways in which the GMB addresses such issues, focusing on pay, career progression opportunities, negative changes to work environments, health and safety, and a lack of enforceable employment rights. This women’s space enables women to discuss these common workplace issues, develop a political consciousness by linking things that affect them to systematic problems, gain confidence, and raise issues as ‘motions’ for the national union to deal with in its political and industrial strategies. Until recently, the regional women’s networks have not all been active and have not been connected, which limits their potential to transform the union in this way. Since my dissertation was published, however, the first national women’s conference was held in Liverpool. This gave new and experienced women activists from across the country the chance to meet, share their stories, and learn more about what they can do as activists in their workplace and in politics. I strongly hope that as a national women’s network becomes more organised, and financially and logistically supported by the union, the better gendered class issues will be addressed by the GMB. Laura, Joanne, Grace, Catherine, and Martha* are members of the Radical Women’s Network. They believe that there’s still a lot left to be done to protect women workers – and they won’t stop until they’ve helped achieve it. Laura: “We want what the men have. We want respect. I’ve got a girl who works with me, Sarah. She’s 39, and she’s riddled with rheumatoid arthritis. So I make sure she gets two days off, I make sure she gets her hospital appointments, her blood tests, all that off. She doesn’t want to stop work – she’s only 39. You’ve got to look after people, you know. Someone’s got to fight people’s corners. My first thing about the equal pay question was that the cleaners – or at least that’s what they were called – were doing a lot more than just cleaning. They were doing table service, they were doing food prep… and I thought, this isn’t fair. Joanne: “I had my own branch at one time, but I’ve actually got a memory problem now. I used to be very active. It became my life, you know? And I had three kids, but everything worked around the union. *These names have been changed. ‹ “Stop Abortion” in Poland: Is the Polish Legislation to Become Even More Restrictive? Deadline for abstracts for the International Development PhD conference is 15 May!